Alongside the introduction of the current Apple TV design in fall 2010, Apple launched AirPlay. In short, AirPlay allows a user to watch a movie, listen to a song, or view a photo on an iPhone, iPad, iPod touch (or Mac in some cases) and stream that content to the Apple TV. AirPlay typically works well and we have even considered it a major innovation in the living room appliances space. Apple has continued to enhance AirPlay over the past few years, allowing the service to integrate with iTunes in the Cloud and function without a WiFi connection. With OS X Yosemite and iOS 8, Apple has taken the AirPlay idea to new levels. This fall, as Apple previewed at WWDC earlier this month, a user can begin writing an email, viewing a webpage, or sending a text message on one Apple device, and then walk up to a different Apple product and continue that action. This feature is called Handoff and is part of a new suite of features called Continuity. Unlike AirPlay, a click to stream the content is not necessary. The above notification is appearing on some OS X Yosemite machines on the same local WiFi network as Apple TVs running the new 7.0 beta software. This indicates that Yosemite Macs are expecting to be able to integrate with the Apple TV via Handoff. Unfortunately, there does not appear to be any references on either the new Apple TV software or OS X as to what Handoff between iOS devices/Macs and Apple TVs could mean, but there are some speculative possibilities. Instead of needing to use AirPlay, Continuity and Handoff could technically allow a person to begin watching a movie on their iPad or iPhone, walk into their house, and that content will immediately and automatically begin playing on the Apple TV instead. Differentiating from AirPlay, there is no streaming from the iOS device involved and the process requires little to no user input. 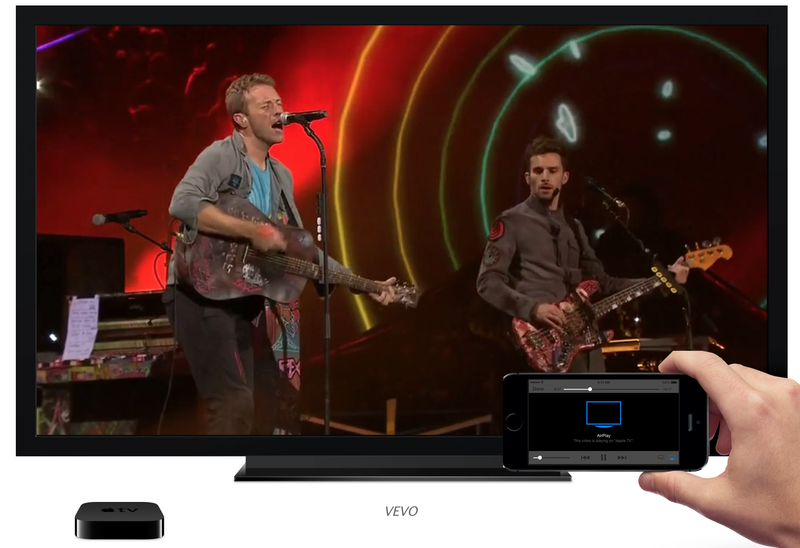 The content, instead, could be streamed to the Apple TV from the user’s iTunes in the Cloud account. The same technology could be used for automatically handing off an iTunes Radio playlist, a song from iTunes Match or iTunes in the Cloud, or even photos from the new iCloud Photo Library feature. It will be interesting to see if Apple opens up Continuity and Handoff to third-party developers who have applications on both the Apple TV and iOS. An imaginable scenario is a user watching a video on Netflix or Vevo on their iPad and then being able to automatically continue doing so on their Apple TV. Handoff requires devices with a Bluetooth 4.0 low-energy chip to function, and the latest third-generation Apple TV includes that hardware. Notably, the 2010 second-generation Apple TV does not support Bluetooth 4.0, and it coincidentally will not be receiving the Apple TV 7.0 software update in the fall. Of course, this pop-up message indicating Continuity for Apple TV could simply be a bug or just an indication that Apple is considering the feature, but based on Apple’s push for more tightly integrating all of its devices, it definitely makes sense for Apple to allow Handoff for Apple TV. The new Apple TV update will arrive in the fall around the same timeframe as iOS 8 and OS X Yosemite. Apple is also said to be working on an updated version of the Apple TV set-top box with a redesigned user-interface, so perhaps these new features could tie into the announcements surrounding that future hardware. Apple TV gaining Continuity and Handoff will further embed the device within Apple’s larger ecosystem of hardware, opening up the door for future hardware sales, more content downloads, and perhaps, one day, a new platform for App Store developers.